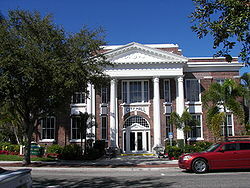 Punta Gorda is a city of Florida in the United States. It is the county seat of Charlotte County. ↑ "Florida by Place. Population, Housing, Area, and Density: 2000". US Census Bureau. Retrieved 2007-10-13. ↑ "Punta Gorda, FL Profile". IDcide. Retrieved 2008-10-15. ↑ "Annual Estimates of the population for the Incorporated Places of Florida" (XLS). US Census Bureau. Retrieved 2007-10-13. This page was last changed on 4 May 2018, at 12:27.